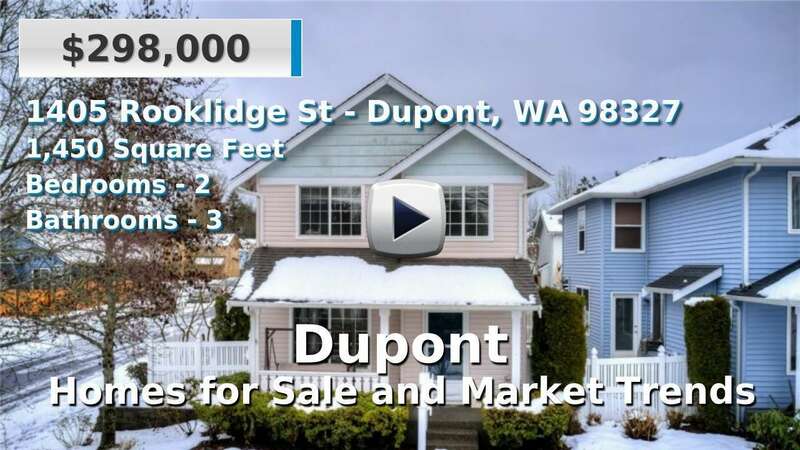 DuPont is a city in Pierce County with just over 8,000 residents. It is a small, suburban area that is growing rapidly thanks to its convenient location next to Joint Base Lewis-McChord, a large Army-Air Force base, and its proximity to the greater Seattle metro area. Homes for sale here are quite new and the average commute is one of the lowest in the area at just 22 minutes. Though DuPont is still expanding, it has both major cities and untouched nature for close neighbors; Tacoma, Lakewood, and Seattle to the north, Olympia-Lacey to the south, and the Nisqually National Wildlife Refuge on its western border. The small city sits on the southern end of the Puget Sound. 3 Beds | 3.25 Baths | 2603 sq. Ft.
3 Beds | 1.75 Baths | 1329 sq. Ft.
5 Beds | 2.5 Baths | 2657 sq. Ft.
3 Beds | 2 Baths | 1798 sq. Ft.